The Mark Twain Shrine Club and Kosair Charities partner together to present Laura Furkins, a student at Adair County High School, with an Inogene portable oxygen machine purchased through Community Health. Her classmates, teachers and Special Education Director for the school district joined alongside Laura for the surprise presentation. Laura’s mother, Louise states that she is glad the Shriners helped in her daughter’s situation because the current one was becoming problematic. Louise feels the Shriners is a wonderful organization that helps kids in need and encourages others to join their organization. 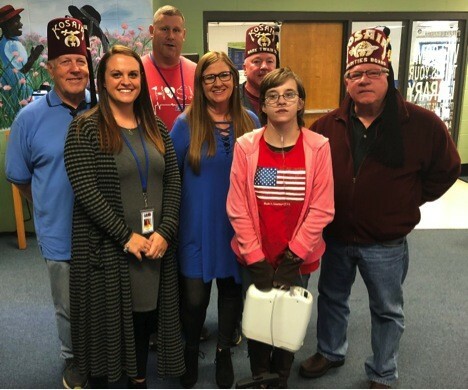 Pictured are (front row): Brooke Beard, Teacher; Anita Goode, District Special Education Director; Laura Furkins, Student receiving the donation and Robert Flowers, Shriner (back row) Paul Smith, Shriner; Richard Soule, Teacher and Joe Flowers, Shriner. Photo by Jason Rector.